The CentraXX Patient App is now available. CentraXX Patient App – with the growing awareness that every patient is different and that different therapies are often necessary for recovery when diagnoses are the same, the importance of digital instruments such as health apps is growing. These apps support individualized therapies, record objective and subjective patient data, and improve continuous communication between doctor/physician and patient. Improved communication between doctor and patient and the right to a complete information, to which the patient even has an enforceable legal claim according to §630g BGB (inspection of the patient file), Art. 20 DSGVO (right to data transferability). With more than 50 million smartphones in Germany alone (number continues to rise), the mobile app is an important, personal communication and information interface between physician and patient. Against this background alone, it is only a natural step that KAIROS offers CentraXX users this additional communication tool – embedded in the CentraXX architecture – with the CentraXX Patient App. The app is equally useful for both the clinic and the patient. The importance of patient report-outcomes (PRO)/patient-report-outcome-measures (PROM) is increasing steadily. However, much of this patient information is still recorded on paper. With the use of the KAIROS ePRO-Technology and the CentraXX Patient App, this is no longer necessary. The CentraXX Patient App enables patients to submit their own assessments and their state of health directly to CentraXX (or the clinic) in digital form, in a direct and independent manner (24/7). For example, ICHOM standard sets can be used to structure the information (ICHOMready). This patient-reported information offers the clinician important opportunities for comparison – in other words, additional decision-making aids that are now also important for the patient from the point of view of patient empowerment and within the framework of decision support models. 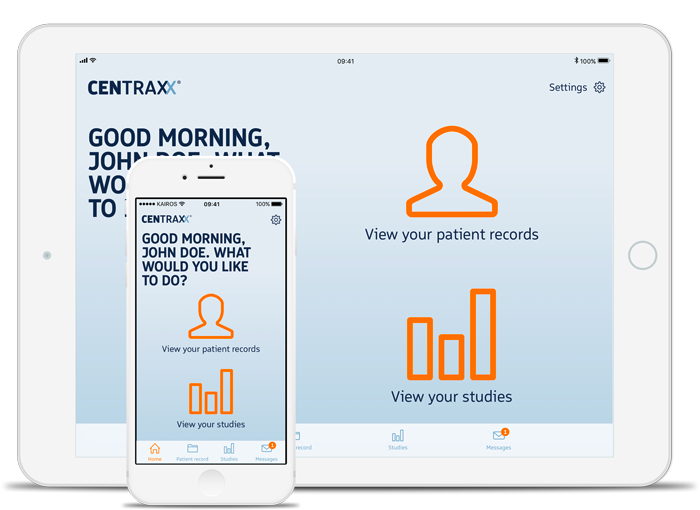 The use of the CentraXX Patient App also leads to real win-win situations with regard to recruitment for clinical studies. In CentraXX, the clinic can identify persons who are qualified for studies and directly and purposefully invite them to participate. Push messages can be used for this. These push messages are not only used for fast, direct information of the user, but also to maintain constant contact (relocation etc.) and to “activate” the patient again, if necessary. On the other hand, the patient also benefits from this always up-to-date information transfer and the associated possibility to participate in planned or in current studies for which he is qualified. Finally, the overall quality and success of studies can be improved by effectively recruiting as many suitable participants as possible, while complying with all data protection requirements. The app becomes a matching platform – the interface between patient and research and/or patient and pharmaceutical industry. Of course the patient is always in charge and decides on his own with whom he shares his data. Detailed information about the CentraXX Patient-App can be found on the Patient-App product sheet.